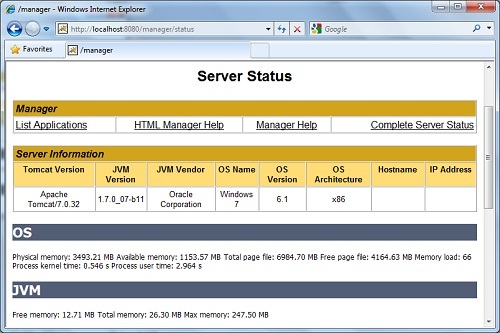 This section provides a tutorial example on how to review the Apache Tomcat 7 server status Web page, which provides HTTP and AJP protocol service statuses; Tomcat, JVM, and OS information; as well as a link to list all running applications. After adding user role, name and password in the tomcat-users.xml configuration file, I went on to see if I can use it to access the server status page on the Web GUI. 1. Shut down and re-start the Tomcat server. 2. Visit http://localhost:8080/ with a Web browser again and click on the "Server Status" button. Manager - Provide the link to the "List Applications" page. "ajp-apr-8009" (AJP = Apache JServ Protocol) - No AJP requests are being processed at port 8009. "http-apr-8080" - 1 HTTP request is being processed at port 8080, "GET /manager/status HTTP/1.1". That is the request for the server status page.